It's May.... I know I say this every month but where the heck did it go?!?! I swear the months are flyyyying by even faster! April was amazing, perhaps even better than March, dare I say!? With April over that means I am one step closer to summer. PRAISE JESUS HALLELUJAH! I was honestly so busy this month that I didn't even keep track of my favorites. There is probably a bunch of stuff I absolutely loved but forgot to add..... Anyways, here's what I did manage to remember! No. 1: Annie's Bunny Fruit snacks// Because I am still a kid at heart I love fruit snacks. I will eat pretty much any kind but these take the cake. I am obsessed! They'er organic and aren't made of high fructose corn syrup or have added junk. They're so delicious. I could eat these all day, everyday. No. 2: Kids In Love// If you haven't heard of The Mowgli's you are missing out. I first heard them when they performed at Buzz Beach Ball last year and instantly became a fan. I recently saw them earlier this month and they played tons of songs from their new album, which also debuted. IT IS SO GOOD! My favorites are Kids In Love, Bad Dream, Whatever Forever, Shake Me Up and Home To You. Seriously go listen to them. No. 3: New Girl// I know, I know I am the last person to jump on the New Girl bandwagon but hey, better late than never! Per recommendation of a friend I finally started watching it on Netflix and guys, why did I go so long without watching it?! It's hilarious, witty and cute and I love the guys and Jess and Cece and I ship Nick and Jess so hard. If you haven't watched it you need to! I promise you won't regret it! No. 4: Go Blog Social 2015// At the beginning of the month I attended GBS 2015, a 2 day blogger's conference here in KC. It was amazing, as per usual and I met so many brilliant ladies and learned a ton! I have a recap of day 1, day 2, what I wore and what I learned. No. 6: Lilly For Target// The highly coveted Lilly For Target collab debuted this month and it was pandamonium! It sold out both online and in stores within minutes! It was insane. I was lucky enough to get a few pieces that I wanted. You can check out which ones in my haul post. No. 7: Cobalt blue// This month I've been looooving the color cobalt. I already have 3 items that are the color and I need more! It's such a fun, bright color for spring and summer. Plus, it looks fantastic with a tan. I'm looking for a cobalt top to wear with white jeans. If you have any suggestions comment down below! :) Striped dress and striped top. No. 8: Jack// This month I became a mom.... a cat mom that is. I was babysitting we were playing outside on the driveway. I see this cat sit down by the car and I call over to it. He comes over and instantly starts rubbing on me and wanting me to pet him. I do and he loves it! Eventually we head to the backyard and he follows us. He didn't have a collar and was pretty thin so I thought he was a stray. The odd thing was that he was suuuuper friendly. So I thought maybe he wasn't a stray. Me and my mom drove all around the neighborhood and surrounding area asking people if they had lost a cat or knew who's it was. No one knew anything. So I decided to keep him! Meet the newest member of the family, Jack! He's the absolute sweetest thing! He likes long walks, chasing bunnies (but we don't eat them. Bunnies are friends not food) and being petted and rubbed constantly. He's adjusting to domestic life quite nicely! Nothing scares him and he's so inquisitive. He's pretty great! No. 9: Snapchat// This month I've really been into Snapchat. I don't snap I have no idea how to, but I love watching other people's snaps. 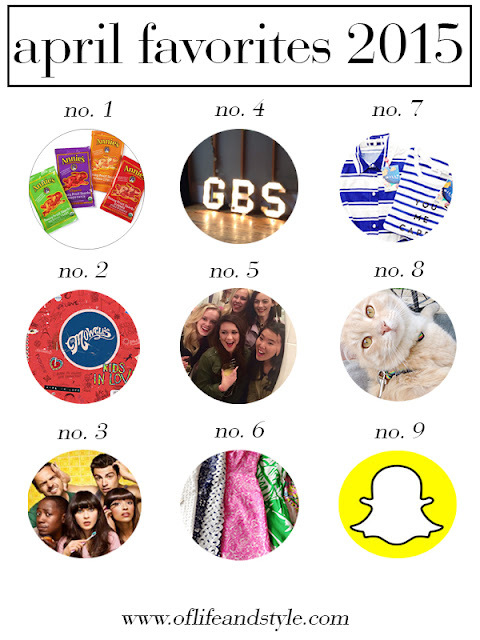 My faaaavorite Snapchatters are Krista Robertson @kristalinn14, Jacey Duprie @damselindior, Meghan Rienks @itmeghan, Jessica @jessicasturdy. They crack me up with their snaps! They're so real and honest and just plain hilarious. Like I said this was a super busy month and there are probably a whole laundry list of favorites that I forgot! #Oops April was another especially good month. Each month just keeps getting better and better! I already have a feeling May is going to be the best yet!